Curto, Silvio. Gli Scavi Italiani a el-Ghiza (1903). Rome: Centro Per Le Antichitá E La Storia Dell'Arte del Vicino Oriente, 1993. Remarks Brother ([sn=f] his brother) of Kai (owner of unnumbered mastaba excavated by Schiaparelli). Appears on secondary false door (Turin S.1845) inscribed for Kai, south jamb, second register, identified as [rx nswt] royal acquaintance; found in situ in mastaba of Kai. Remarks Appears (without family relationship, if any, indicated) on false door (Turin S.1843) of Iteti (owner of G 7391), south outer jamb (third register, carrying box[? ]), identified as [xtmw] sealer; found in situ in east face of G 7391. Remarks Appears on false door (Turin S.1840) inscribed for Wehemnefret (owner of Wehemnefret, unnumbered mastaba excavated by Schiaparelli, probably part of mastaba S 984 excavated by Junker), south outer jamb (third register, figure on right); found in mastaba of Wehemnefret. Remarks Son ([sA=f smsw] his eldest son) of Medunefer (owner of G 4630). Appears on south false door tablet, standing before his parents Medunefer and Nebuka seated at offering table; south false door (Cairo EMC_JE_36191) dedicated by Ankhiris; found in situ in G 4630. North false door (Cairo EMC_JE_36192) inscribed for Ankhiris (dedicated by his son Medunefer), identified as [sS pr-mDAt nTr smA jnpw xt wr Tntt] scribe of the library of the god, smA-priest of Anubis, khet-priest of the Great One and of Tjentet; found in situ in G 4630. Also appears on false door (north jamb) inscribed for Nensedjerkai (owner of G 4631), identified as [Xrj-Hb smA jnpw xt wr] lector-priest, smA-priest of Anubis, khet-priest of the Great One; in situ in G 4361. 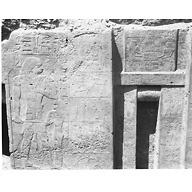 Remarks Appears on false door (Turin S.1840) inscribed for Wehemnefret (owner of Wehemnefret, unnumbered mastaba excavated by Schiaparelli, probably part of mastaba S 984 excavated by Junker), south outer jamb (top register, figure on left), identified as [xtmw-nTr wjA nfr] god's sealer of the ship, recruit; found in mastaba of Wehemnefret. 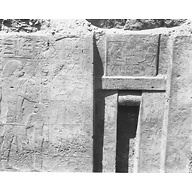 Remarks Appears (without family relationship, if any, indicated) in chapel relief in tomb of Iteti (owner of G 7391), chapel entrance door jamb (facade face, south outer jamb, bottom register, carrying small animal), identified as [Hm-kA] ka-priest; in situ in G 7391. Remarks Son ([sA=f] his son) of Kai (owner of unnumbered mastaba excavated by Schiaparelli). Appears on secondary false door (Turin S.1845) inscribed for Kai, north jamb, second register; found in situ in mastaba of Kai. Remarks Owner of G 4911. False door (Turin S.1846) inscribed for Ankhtef, identified as [rx nswt wab nswt Hm-nTr xwfw] royal acquaintance, royal wab-priest, priest of Khufu; found in G 4911. Remarks Daughter ([sAt=f] his daughter) of Iteti (owner of G 7391). Appears in chapel relief, west wall (depicted as young girl standing behind her parents); in situ in G 7391. Remarks Offering bearer holding small vessel on south inner bottom register of false door of Neferka (owner of unnumbered mastaba excavated by Schiaparelli); in situ in mastaba of Neferka. Remarks Appears on primary false (Turin S.1844) door of Kai (owner of unnumbered mastaba excavated by Schiaparelli), north outer jamb, fourth register, depicted carrying duck; found in situ in mastaba of Kai. Remarks Wife ([Hmt=f] his wife) of Ankhtef (owner of G 4911). Appears on false door (Turin S.1846) inscribed for Ankhtef; found in G 4911. Remarks Owner of G 5110. Appears in chapel relief (west, south, east, and north walls [only lower legs and feet preserved in situ on west, east, and north walls], and chapel entrance north and south door jambs), and displaced fragment of lintel (MFA 34.1465), identified as [sA nswt n Xt=f jrj(-pat) HAtj-a tAjtj sS mDAt-nTr r nxn r p nb] king's son of his body, hereditary (prince), count, vizier, scribe of the divine book, mouth of Nekhen, mouth of every Butite; in situ in G 5110. Uninscribed sarcohpagus of Duaenre (Turin S.1838, Turin S.1839); Schiaparelli excavations. Possibly same individual as Duare (in G 3098b) and/or Duaenre (in G 8172). Remarks Daughter(?) of Tjentet, wife of Neferka (owner of unnumbered mastaba excavated by Schiaparelli). Appears standing with her mother in relief south of false door, top register; in situ in mastaba of Neferka. Remarks Appears (without family relationship, if any, indicated) three times in chapel relief in tomb of Iteti (owner of G 7391), chapel entrance door jamb (facade face, north outer jamb, middle register, presenting vessel), north wall (second register, kneeling, top row, second figure from left), and false door (Turin S.1843) of Iteti, north inner jamb (bottom register); relief in situ and false door found in situ in east face of G 7391. Remarks Appears on false door (Turin S.1840) inscribed for Wehemnefret (owner of Wehemnefret, unnumbered mastaba excavated by Schiaparelli, probably part of mastaba S 984 excavated by Junker), south inner jamb (top register), identified as [Hm-kA] ka-priest; found in mastaba of Wehemnefret. Remarks Appears on south false door (Cairo EMC_JE_36191) inscribed for Medunefer (owner of G 4630), north outer jamb (middle register, carrying ewer), identified as [sS pr-mDAt nTr] scribe of the library of the god; also listed as one of Medunefer's [msw=f nw Dt] children of the funerary estate; found in situ in G 4630. Remarks Man censing on north outer middle register of false door of Neferka (owner of unnumbered mastaba excavated by Schiaparelli), identified as [Hm-kA] ka-priest; in situ in mastaba of Neferka. Remarks Owner of Hetepi (2) (unnumbered mastaba, perhaps a later reuse/modification of the secondary (northern) cult niche of Hetepi (1); exact location uncertain). False door (Turin S.1847) inscribed for Hetepi, identified as [sHD xntjw-S pr-aA xntj-S pr-aA Hrj-sStA] inspector of palace attendants of the Great House, palace attendant of the Great House, secretary; found in mastaba of Hetepi [Hetepi (2)]. His identical name and titles may suggest that the owner of Hetepi (2) is a son or other family member of the original Hetepi. Remarks Son ([sA=f] his son) of Kai (owner of unnumbered mastaba excavated by Schiaparelli). Appears on secondary false door (Turin S.1845) inscribed for Kai, north jamb, fourth register; found in situ in mastaba of Kai. Remarks Appears (without family relationship, if any, indicated) twice in chapel relief in tomb of Iteti (owner of G 7391), north wall (second register, kneeling, top row, last figure on right), and false door (Turin S.1843) of Iteti, south inner jamb (bottom register); relief in situ and false door found in situ in east face of G 7391. Remarks Mother ([mwt=s] her mother) of unidentified wife (?) of Kai (owner of unnumbered mastaba excavated by Schiaparelli). Appears on secondary false door (Turin S.1845) inscribed for Kai, north jamb, top register; found in situ in mastaba of Kai. Remarks Appears (without family relationship, if any, indicated) twice in chapel relief in tomb of Iteti (owner of G 7391), chapel entrance door jamb (facade face, north outer jamb, top register), and west wall (second register, second figure from right, presenting two rolls of linen); in situ in G 7391. Remarks Appears (without family relationship, if any, indicated) in chapel relief in tomb of Iteti (owner of G 7391), north wall (second register, seated, last figure on left), identified as [rxt nswt] royal acquaintance; in situ in G 7391. Remarks Offering bearer holding linen roll on south inner bottom register of false door of Neferka (owner of unnumbered mastaba excavated by Schiaparelli); in situ in mastaba of Neferka. Remarks Owner of G 4811+4812: G 4811. False door inscribed for Irankhptah, identified as [rx nswt jmj-r wabt jmj-r Hmwtjw n pr-aA jmj-r kAt nt nswt] royal acquaintance, overseer of the wabet, overseer of craftsmen of the Great House, overseer of royal works; also appears in chapel relief, west wall (panel of relief south of false door, standing figures of Irankhptah and his son Ptahrudj), east wall (north of entrance, lower part of standing figures of Irankhptah and his wife[?] sketched in red paint); lower part of false door and panel of relief still in situ in G 4811 south chapel. Remarks Sister ([snt=f] his sister) of Kai (owner of unnumbered mastaba excavated by Schiaparelli). Appears on primary false door (Turin S.1844) of Kai, south inner jamb, third register; found in situ in mastaba of Kai. Remarks Appears (without family relationship, if any, indicated) twice in chapel relief in tomb of Iteti (owner of G 7391), west wall (third register, second figure from right), and false door (Turin S.1843) of Iteti, south outer jamb (second register, carrying bird), identified as [jmj-r Hmw-kA] overseer of ka-priests; relief in situ and false door found in situ in east face of G 7391. Remarks Son ([sA=f] his son, [sA=f wr] his eldest son, [sA n Xt=f] son of his body) of Iteti (owner of G 7391). Appears four times in chapel relief, chapel entrance door jambs (facade face: south inner jamb, bottom register, presenting goose; north inner jamb, bottom register, presenting hare; reveal face: north jamb, bottom register), and west wall (depicted as young boy holding his father's staff); in situ in G 7391. Remarks Appears on south false door (Cairo EMC_JE_36191) inscribed for Medunefer (owner of G 4630), south outer jamb (middle register, censing), identified as [sS pr-mDAt nTr] scribe of the library of the god; also listed as one of Medunefer's [msw=f nw Dt] children of the funerary estate; found in situ in G 4630. Remarks Owner of mastaba of Itjer (unnumbered mastaba, location unknown). False door tablet (Turin S.1849) inscribed for Itjer, identified as [rx nswt] royal acquaintance; lintel (Turin S.1865/1) inscribed for Itjer, identified as [rx nswt sHD nfrw jmj-r pr] royal acquaintance, inspector of recruits, steward; fragment of lintel(?) (Turin S.1865/2) inscribed for Itjer, identified as [jmj-r pr] steward; Schiaparelli excavations, find spot(s) unknown. Remarks Son of Khentkaus (owner of Khentkaus, unnumbered mastaba excavated by Junker). Appears on false door (Turin S.1848/1) inscribed for Khentkaus (north inner jamb); found in mastaba of Khentkaus (removed by Schiaparelli). Remarks Appears on primary false door (Turin S.1844) of Kai (owner of unnumbered mastaba excavated by Schiaparelli), south jamb, fourth register, depicted carrying sack and staff; found in situ in mastaba of Kai. Remarks Appears (without family relationship, if any, indicated) in chapel relief in tomb of Iteti (owner of G 7391), north wall (second register, kneeling, top row, first figure on left); in situ in G 7391. Remarks Appears on false door (Turin S.1840) inscribed for Wehemnefret (owner of Wehemnefret, unnumbered mastaba excavated by Schiaparelli, probably part of mastaba S 984 excavated by Junker), south inner jamb (middle register), identified as [Hm-kA] ka-priest; found in mastaba of Wehemnefret. Remarks Name appears on false door (Turin S.1848/1) inscribed for Khentkaus (north inner jamb, lower register); found in mastaba of Khentkaus (unnumbered mastaba excavated by Junker, false door removed by Schiaparelli). Remarks Offering bearer holding linen rolls on south outer middle register of false door of Neferka (owner of unnumbered mastaba excavated by Schiaparelli); in situ in mastaba of Neferka. Remarks Offering bearer leading antelope on south outer second register of false door of Neferka (owner of unnumbered mastaba excavated by Schiaparelli); in situ in mastaba of Neferka. Remarks Owner of unnumbered mastaba excavated by Schiaparelli. Two false doors from mastaba of Kai: primary false door (Turin S.1844), Kai appears on south inner jamb, top register; secondary false door (Turin S.1845) inscribed for Kai, identified as [rx nswt] royal acquaintance; both found in situ in mastaba of Kai. Remarks Son ([sA=f] his son) of Medunefer (owner of G 4630). Appears on south false door (Cairo EMC_JE_36191) inscribed for Medunefer, right flange of tablet (bottom register, carrying bird); found in situ in G 4630. Remarks Appears on false door (Turin S.1840) inscribed for Wehemnefret (owner of Wehemnefret, unnumbered mastaba excavated by Schiaparelli, probably part of mastaba S 984 excavated by Junker), south inner jamb (bottom register), identified as [Hm-kA] ka-priest; found in mastaba of Wehemnefret. Remarks Offering bearer holding linen roll(?) on south outer middle register of false door of Neferka (owner of unnumbered mastaba excavated by Schiaparelli); in situ in mastaba of Neferka. Remarks Son ([sA=f] his son) of Kai (owner of unnumbered mastaba excavated by Schiaparelli). Appears on secondary false door (Turin S.1845) inscribed for Kai, south jamb, fourth register; found in situ in mastaba of Kai. Remarks Son ([sA=s mrjj=s] her beloved son) of Khentkaus (owner of Khentkaus, unnumbered mastaba excavated by Junker). Appears on false door (Turin S.1848/1) inscribed for Khentkaus (south inner jamb); found in mastaba of Khentkaus (removed by Schiaparelli). Also appears in chapel relief, east chamber (west wall, presenting document to standing figure of Khentkaus [name not preserved]), identified as [jmj-r Hmw-kA] overseer of ka-priests; also on fragment of relief (from west chamber); found in mastaba of Khentkaus (west wall in situ). Remarks Brother ([sn=f] his brother) of Kai (owner of unnumbered mastaba excavated by Schiaparelli). Appears on primary false door (Turin S.1844) of Kai, south inner jamb, third register; found in situ in mastaba of Kai. Remarks Brother ([sn=f] his brother) of Iteti (owner of G 7391). 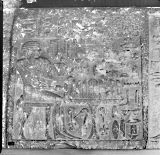 Appears twice in chapel relief, north wall (second register, seated, first figure on right), identified as [sHD wabw wr-xafra] inspector of wab-priests of the pyramid of Khafre, and false door (Turin S.1843) of Iteti, north inner jamb (second register), identified as [rx nswt sHD wabw] royal acquaintance, inspector of wab-priests; relief in situ and false door found in situ in east face of G 7391. Remarks Father ([jt=s] her father) of Tjentet, wife of Neferka (owner of unnumbered mastaba excavated by Schiaparelli). Mentioned in relief south of false door tablet, lower register; in situ in mastaba of Neferka. Remarks Owner of Khentkaus (unnumbered mastaba excavated by Junker). False door (Turin S.1848/1) inscribed for Khentkaus, identified as [Hm-nTr (HwtHr) m swt=s nb Nt Hm-nTr wpt wAwt nb jmAxw xr HwtHr nb(t) nht] priestess (of Hathor) in all her places, priestess of Neith Opener-of-the-Ways, revered before Hathor Mistress-of-the-Sycamore; found in mastaba of Khentkaus (removed by Schiaparelli). Chapel entrance drum lintel inscribed for Khentkaus; also appears in chapel relief [name not preserved]; drum lintel found in mastaba of Khentkaus (relief in situ). Remarks Son ([sA=f] his son) of Kai (owner of unnumbered mastaba excavated by Schiaparelli). Appears on secondary false door (Turin S.1845) inscribed for Kai, north jamb, third register; found in situ in mastaba of Kai. Remarks Son ([sA=f smsw] his eldest son) of Ankhiris and grandson of Medunefer (owner of G 4630). Appears on south false door (Cairo EMC_JE_36191) inscribed for his grandfather Medunefer (dedicated by his father Ankhiris), south outer jamb (top register), identified as [Xrj-Hb] lector-priest; also listed as one of Medunefer's [msw=f nw Dt] children of the funerary estate; found in situ in G 4630. North false door (Cairo EMC_JE_36192) inscribed for Ankhiris, dedicated by his son Medunefer, identified as [Xrj-Hb] lector-priest; found in situ in G 4630. Remarks Brother ([sn] brother) of Kai (owner of unnumbered mastaba excavated by Schiaparelli). 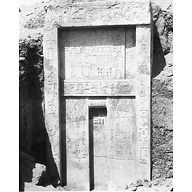 Appears on primary false door (Turin S.1844) of Kai, south inner jamb, fourth register; found in situ in mastaba of Kai. Remarks Sister(?) of Kai (owner of unnumbered mastaba excavated by Schiaparelli). Appears on primary false door (Turin S.1844) of Kai, south inner jamb, fourth register; found in situ in mastaba of Kai. Remarks Appears (without family relationship, if any, indicated) three times in chapel relief in tomb of Iteti (owner of G 7391), west wall (second register, third figure from right, presenting vessel), and false door (Turin S.1843) of Iteti, north outer jamb (second register, carrying calf), identified in both places as [Hm-kA] ka-priest, and north wall (second register, seated, second figure from right), identified as [rx nswt] royal acquaintance; relief in situ and false door found in situ in east face of G 7391. Remarks Son ([sA] son) of Kai (owner of unnumbered mastaba excavated by Schiaparelli). Appears on secondary false door (Turin S.1845) inscribed for Kai, south jamb, third register; found in situ in mastaba of Kai. Remarks Offering bearer holding hyena on north outer fourth register of false door of Neferka (owner of unnumbered mastaba excavated by Schiaparelli); in situ in mastaba of Neferka. Name only partially preserved. Remarks Small boy holding bird on north outer middle register of false door of Neferka (owner of unnumbered mastaba excavated by Schiaparelli); in situ in mastaba of Neferka. Remarks Owner of unnumbered mastaba excavated by Schiaparelli. Appears seated at offering table on false door tablet and standing on north inner register of false door, identified as [rx nswt] royal acquaintance. Also appears in west wall relief south of false door, identified as [wab nswt jrj xt pr-aA (jrj) is jrj sSr ssf Hrj-wDbw rxjjt] royal wab-priest, custodian of property of the Great House, keeper of the is-chamber(? ), keeper of linen and bolts of linen(? ), master of reversion-offerings of the commoners; in situ in mastaba of Neferka. Remarks Mother ([mwt=s] her mother) of Tjentet, wife of Neferka (owner of unnumbered mastaba excavated by Schiaparelli). Mentioned in relief south of false door tablet, upper register; in situ in mastaba of Neferka. Perhaps same person as Peseshnedjet, also identified as [mwt=s], appearing in relief north of false door, top register; in situ in mastaba of Neferka. Remarks Appears (without family relationship, if any, indicated) three times in chapel relief in tomb of Iteti (owner of G 7391), chapel entrance door jamb (facade face, south outer jamb, middle register, carrying hyena), west wall (second register, last figure on left, presenting bird), and false door (Turin S.1843) of Iteti, south outer jamb (bottom register), identified in two places as [Hm-kA] ka-priest; relief in situ and false door found in situ in east face of G 7391. Remarks Appears on primary false door (Turin S.1844) of Kai (owner of unnumbered mastaba excavated by Schiaparelli), north inner jamb, third register, depicted holding cloth; found in situ in mastaba of Kai. Remarks Sister ([snt=f] his sister) of Iteti (owner of G 7391). Appears twice in chapel relief, north wall (second register, kneeling, bottom row, second figure from left), and false door (Turin S.1843) of Iteti, south inner jamb (second register), identified as [rxt nswt] royal acquaintance; found in situ in east face of G 7391. Remarks Appears on primary false door (Turin S.1844) of Kai (owner of unnumbered mastaba excavated by Schiaparelli), south outer jamb, third register, depicted holding basket of offerings; found in situ in mastaba of Kai. Perhaps same individual as Rudjka on same false door, north inner jamb, fourth register. Remarks Offering bearer holding cloth(?) on south outer fourth register of false door of Neferka (owner of unnumbered mastaba excavated by Schiaparelli); in situ in mastaba of Neferka. Remarks Appears on primary false door (Turin S.1844) of Kai (owner of unnumbered mastaba excavated by Schiaparelli), north inner jamb, fourth register, depicted holding cloth; found in situ in mastaba of Kai. Perhaps same individual as Rudj on same false door, south outer jamb, third register. Remarks Appears (without family relationship, if any, indicated) on false door (Turin S.1843) of Iteti (owner of G 7391), north outer jamb (bottom register, carrying antelope), identified as [Hm-kA] ka-priest; found in situ in east face of G 7391. Remarks Appears in chapel relief in mastaba of Khentkaus, west chamber (west wall, bottom register, fourth figure from left); in situ in mastaba of Khentkaus (unnumbered mastaba excavated by Junker). Also appears on false door (Turin S.1848/1) inscribed for Khentkaus (south inner jamb, lower register); found in mastaba of Khentkaus (removed by Schiaparelli). Identified in both places as [Hm-kA] ka-priest. Remarks Appears on south false door (Cairo EMC_JE_36191) inscribed for Medunefer (owner of G 4630), south outer jamb (bottom register, carrying bird), identified as [sS pr-mDAt nTr] scribe of the library of the god; also listed as one of Medunefer's [msw=f nw Dt] children of the funerary estate; found in situ in G 4630. Remarks Son ([sA=f] his son) of Kai (owner of unnumbered mastaba excavated by Schiaparelli). Appears on secondary false door (Turin S.1845) inscribed for Kai, south jamb, top register; may also appear on primary false door (Turin S.1844) of Kai, north inner jamb, top register (name and figure only partially preserved); both found in situ in mastaba of Kai. Remarks Appears (without family relationship, if any, indicated) twice in chapel relief in tomb of Iteti (owner of G 7391), north wall (second register, kneeling, bottom row, first figure on left), and false door (Turin S.1843) of Iteti, north inner jamb (third register), identified as [rx nswt] royal acquaintance; relief in situ and false door found in situ in east face of G 7391. Remarks Son ([sA=f] his son) of Medunefer (owner of G 4630). Appears on south false door (Cairo EMC_JE_36191) inscribed for Medunefer, right flange of tablet (top register, offering linen); found in situ in G 4630. Remarks Appears on primary false door (Turin S.1844) of Kai (owner of unnumbered mastaba excavated by Schiaparelli), north outer jamb, third register, depicted carrying goose; found in situ in mastaba of Kai. Remarks Wife of Iteti (owner of G 7391). Appears in chapel relief, chapel entrance door jamb (reveal face, south jamb, seated with her husband), identified as [rxt nswt] royal acquaintance, and west wall (standing with her husband); in situ in G 7391. Remarks Offering bearer holding small vessel on north outer second register of false door of Neferka (owner of unnumbered mastaba excavated by Schiaparelli); in situ in mastaba of Neferka. Remarks Appears on false door (Turin S.1840) inscribed for Wehemnefret (owner of Wehemnefret, unnumbered mastaba excavated by Schiaparelli, probably part of mastaba S 984 excavated by Junker), north outer jamb (third register, figure on left), identified as [Hm-kA] ka-priest; found in mastaba of Wehemnefret. Remarks Appears (without family relationship, if any, indicated) on false door (Turin S.1843) of Iteti (owner of G 7391), north outer jamb (third register, carrying hyena), identified as [Hm-kA] ka-priest; found in situ in east face of G 7391. Remarks Appears on south false door (Cairo EMC_JE_36191) inscribed for Medunefer (owner of G 4630), north outer jamb (bottom register, carrying bird), identified as [sS pr-mDAt nTr] scribe of the library of the god; also listed as one of Medunefer's [msw=f nw Dt] children of the funerary estate; found in situ in G 4630. Remarks Appears on south false door (Cairo EMC_JE_36191) inscribed for Medunefer (owner of G 4630), north outer jamb (top register, carrying tray of unguent jars), identified as [sS pr-mDAt nTr] scribe of the library of the god; also listed as one of Medunefer's [msw=f nw Dt] children of the funerary estate; found in situ in G 4630. Remarks Wife ([Hmt=f] his wife) of Medunefer (owner of G 4630) or, more probably, of his son Ankhiris. Appears on south false door (Cairo EMC_JE_36191) inscribed for Medunefer (dedicated by his son Ankhiris), left flange of tablet, identified as [rxt nswt] royal acquaintance; found in situ in G 4630. Remarks Wife of Neferka (owner of unnumbered mastaba excavated by Schiaparelli). Appears seated at offering table on false door tablet, standing with her husband on north inner register of false door, and standing with her daughter(?) Henu on south inner register of false door; all in situ in mastaba of Neferka. Also appears in west wall relief south of false door, identified as [rxt nswt] royal acquaintance; in situ in mastaba of Neferka. Also called Henutes on false door tablet. Remarks Offering bearer holding large bird on north inner middle register of false door of Neferka (owner of unnumbered mastaba excavated by Schiaparelli); in situ in mastaba of Neferka. Remarks Offering bearer holding fan on south outer fourth register of false door of Neferka (owner of unnumbered mastaba excavated by Schiaparelli); in situ in mastaba of Neferka. Possibly same person as Tjentet, wife of Neferka. Remarks Daughter of Khentkaus (owner of Khentkaus, unnumbered mastaba excavated by Junker). Appears on false door (Turin S.1848/1) inscribed for Khentkaus (north inner jamb); found in mastaba of Khentkaus (removed by Schiaparelli). Remarks Son ([sA=f] his son) of Iteti (owner of G 7391). Appears three times in chapel relief, chapel entrance door jambs (facade face, north inner jamb, top register, carrying bird; reveal face, north jamb, middle register), and west wall (third register, first figure on right); in situ in G 7391. Remarks Son ([sA=f] his son) of Iteti (owner of G 7391). Appears three times in chapel relief, chapel entrance door jamb (facade face, north inner jamb, middle register, carrying goose; reveal face, north jamb, top register), and west wall (second register, first figure on right, censing before his parents); in situ in G 7391. Remarks Appears on false door (Turin S.1840) inscribed for Wehemnefret (owner of Wehemnefret, unnumbered mastaba excavated by Schiaparelli, probably part of mastaba S 984 excavated by Junker), north inner jamb (bottom register), identified as [Hm-kA] ka-priest; found in mastaba of Wehemnefret. Remarks Appears (name and figure only partially preserved) on primary false door (Turin S.1844) of Kai (owner of unnumbered mastaba excavated by Schiaparelli), south outer jamb, second register; found in situ in mastaba of Kai. Remarks Appears (name and figure only partially preserved) on primary false door (Turin S.1844) of Kai (owner of unnumbered mastaba excavated by Schiaparelli), north outer jamb, second register; found in situ in mastaba of Kai.